I’m thankful to have both of my grandmothers still alive. One, though, lives in a nursing home. She has bad ankles, memory loss, and internal issues that prevent her from living a normal, “everyday” life in the home she’s always known. My wonderful mother always visits her, not just because that’s her own mom, but because it helps to defeat something that is an unfortunate byproduct. And that’s loneliness. We all experience it at some point; it’s a strange feeling that causes a longing for companionship of any kind, be it a close friend, a dear lover, or a thoughtful family member. Yet it’s really easy to cure. You can visit them personally like my mom, or you can call to talk, send a text, or even mail a letter to show that somebody out there is looking out for them. No matter the size of the gesture itself, simply “being” there for another person in there time of need has a profoundly, positive impact on his or her life. This is the idea that Kamisama Hajimemashita 2nd Season works with, presenting an anime that at least doesn’t make you feel lonely. Kamisama Kiss 2 follows a short period after the events of the first season. Nanami is still a land god, Tomoe is her familiar, and the two find themselves embarking on more heavenly journeys together. What’s interesting about this second season is that it really only has two main focuses: this theme of loneliness and indirect character exploration (which will be discussed later). Loneliness is very strange. Like coldness, it’s simply thelack of something else. In this case, it happens to be relationships or connections we share with the people around us. It, by definition, implies a sense of longing, of wanting to have that which we don’t. Because most people don’t actively seek to be alone; it’s human nature to want to be with and surrounded by others. 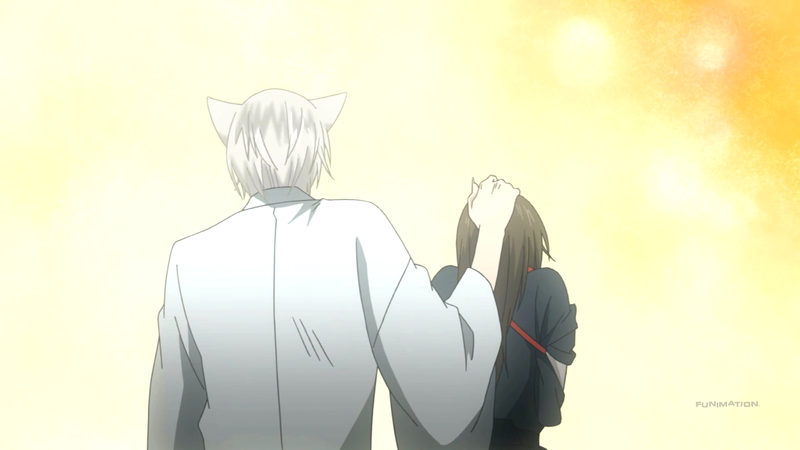 To this end, Kamisama Kiss 2 sets up each of its three arcs with loneliness in mind. These three plot lines revolve around: Akura-ou, Jiro and Kurama, and Nanami, respectively. But it’s not that the show simply brings up the topic, but how it explores this theme that makes it so purposeful. Specifically speaking, the anime does a nice job of showing what causes loneliness,how we deal with it, and ultimately how it is cured. Assuming loneliness is something that is unwanted, it’s not always caused by our own devices. More often than not, it’s something that manifests through outside influences. Each arc demonstrates this aptly: Akura-ou lost and was betrayed by his best friend; Kurama was bullied as a child; and Nanami was affected by unfortunate circumstances. There is a correlation between each example, that being it is others that force such lonely feelings on another. It’s ironic, really – it’s precisely the very aspect of life that these people need that has generated it in the first place. Jiro’s case is the same but different; he willingly pushed those around him away despite the comfort they could provide to his stern heart. Just as each person’s loneliness was brought about in its own way, the anime also shows how these same characters handle the feeling they acquired. 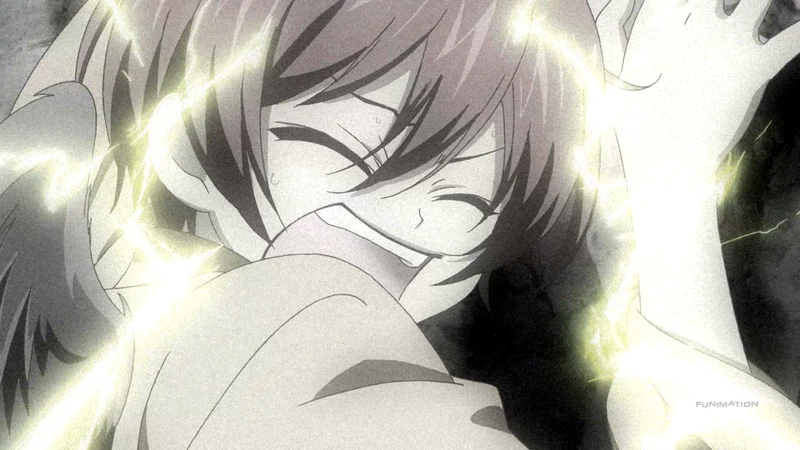 For Akura-ou, he turns it into revenge and rage, not just towards the friend who crossed him but towards all others. In a way, he wants people to experience the same feelings of loss and loneliness that he has felt. Kurama instead chooses to create a mask of sorts to attract people. He had always been alone, so being able to entice others to follow or idolize him was something he had never known – and always wanted. And Nanami is special. Her mother passed away when she was little and her father was a chronic gambler. Whether by bad luck or terrible coincidence, she had nobody to turn to. But rather than hurting or seeking others, her happy and active personality kept her both optimistic and adaptable. It turns out to be rather sad, seeing these characters succumbing to an emotion that leaves one feeling helpless or afraid. This is why the anime makes sure to alleviate these worries. Akura-ou, despite his anger, enjoys the niceties his “mother” directs towards him, proving that even the most evil of people revel in another’s company. Kurama had Suiro, the only other “tengu” to support him. Suiro’s physical saving of the boy wasn’t his greatest feat; it was being there to guide him when nobody else would. And while nowadays Nanami has her rambunctious crew to govern, Tomoe’s time spent with her kid-self implanted memories that trumped some of the more depressing ones. Her cure is a bit unrealistic, all things considered, but it hammers home a poignant statement: loneliness is not absolute. It can be defeated and it can be avoided; all that’s needed is a tiny bit of love. The art for Kamisama Kiss 2 remains relatively the same when compared to the first season. It’s usually soft, inviting the audience to relax in its sparkling backgrounds, fluffy locations, and serene environments. Other times, it gets drearier, with miasma-filled forests and darkened valleys. And it can go further still, providing locales fraught with danger, despondency, and despair. The blend of the godly settings with the more realistic ones is appropriately carried out, giving the anime a good sense of direction overall. On top of all this, the show also adopts a minimalist style that aides in making the comedy that much more hilarious. The character designs, like the art, keep their consistency. Nanami is once again strangely beautiful. It isn’t her large eyes, full smile, and long brown hair that make her grab one’s attention – but these simple details definitely don’t hurt her – but rather this aura she has about her that makes her more womanly and refined than she tends to behave. Other regulars like Tomoe and Himemiko maintain their white attire and purple persona, respectively. And the newcomers receive the same attention to detail; Jiro’s green cloak and red-painted eyes make him out to be as menacing as he is, whereas Yatori’s massive hair, funny mask, and crazy pupils capture his ridiculousness quite well. When it comes to actual animation, it sits somewhere around average. Much of the show focuses on the characters, their conversations, and the thoughts they are having. Meaning, lots of sitting and near still-frames are had. There isn’t too much action, and even when it does occur, its regular running or walking segments. In the initial section, the notion of “indirect character exploration” was introduced. What does this mean? Essentially, the characters that Kamisama Kiss 2 sets its sights on might seem to be the ones gaining a lot of the focus. But in actuality, they use these characters to bolster those nearby – these close characters receive characterization and development indirectly through the ones that have the majority of the attention. This isn’t to say that the “bystanders” aren’t looked at individually; it’s that the indirect comparisons are stronger. Or to put it differently, they allow the viewer to see these characters in a roundabout perspective. An obvious contender for this approach is Jiro. Kurama’s arc takes up about half of the season, and initially it seems as if he is the focus. But Kurama’s experiences – and indeed many of the other “tengus” encountered throughout this segment – work towards bolstering Jiro’s person. There are distinct parallels between Jiro’s and Kurama’s upbringing. Both were ridiculed for their general weakness, with both wanting to become stronger than they were. Suiro’s relationship towards Kurama was initially seen by Jiro as a mistake; that it only brought about pain. But he sees that such pain gave way to something greater: elation. For as was talked about, Jiro and Kurama at one point had no friends to call their own. So Jiro sees Suiro’s relationship with the young Kurama as something to be revered and not something to be shunned. The little “tengu” brothers further make him understand the abusive stance he’s taken. He witnesses that he treats these “weak” children exactly in the same manner as he had been treated years prior, causing him to question his own goals. And even Nanami influences him. While he saves her from the thunder-beast – more parallels between Kurama and Suiro – its him seeing this young, “heretic” of a woman protect that which he was not that motivates him to see both the literal and figurative light around him. A fascinating detail about this sequel is in who it’s actually about. 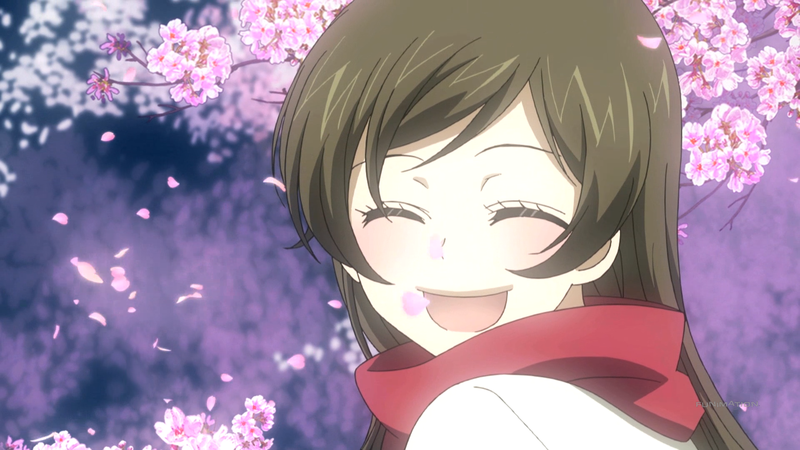 The first focused on Nanami and her rise to god-hood, all the while toying with the romantic connection between her and Tomoe. Here, though, and hearkening back to the idea of “indirect character exploration,” this isn’t a season about Akura-ou, Jiro, or even Nanami. It’s in reality about Tomoe. 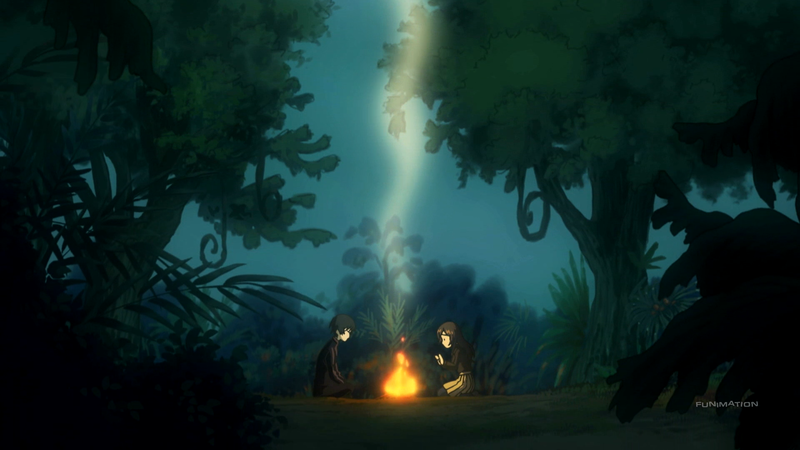 Every arc has him more or less on the sidelines, but the events that take place and subsequently the characters’ exploration leads to his development. For example, through Akura-ou, we come to learn more about Tomoe’s unsavory past and eventual change of heart. He also (indirectly) forces Tomoe to question the same connection that was already established previously. Jiro provides his own form of mirroring, with Tomoe seeing the same, inner-turmoil in the winged man. And Nanami’s past elicits, perhaps coincidentally, childlike wonderment. Her first-ever backstory gives Tomoe the wherewithal to push their relationship towards a place that he truly wants it to go. Because despite all of his abrasive words towards his master, and aligning with the themes of the anime, Tomoe is lonely. Nobody understands or loves him – the gods fear his powers and his closest “friend” Mizuki constantly quarrels with him. Nobody, that is, besides Nanami. In other words, the entirety of Kamisama Kiss 2 was structured to get Tomoe primed and ready for the feelings he’s always wanted, and to leave behind the loneliness he’s felt for way too long. The opening theme is quite dainty, with the flute, guitar, and vocalist creating more fun than it should. This keeps up for most of the song, even picking up in tempo and rhythm during the middle portions. Its conclusion ends on an oddly somber note, as an indication that the show isn’t just fun and games. And the motif on loneliness proves this without a doubt. The ending theme is very slow, contrasting with the OP with ease. Lyrically, it follows the theme of loneliness once more; the constant “Hello? Can you hear me?” phrase is similar to a call for help, to get someone to notice that he or she is there. It’s purposefully built, but the piece itself isn’t as catchy as its beginning counterpart. The rest of the soundtrack is heavily influenced by the culture of the world Namani and co. find themselves in. “Korin! Okuninushimikoto” is a lovely piece, filled with powerful movements and strong emotion. “Chigiri…Futatabi?” is melancholic in its presentation, yet strangely hopeful in feeling. And “Sarani Shisso! Taima Kekkai” is entirely upbeat, coinciding with the show’s general happy tones. It’s a pleasant OST containing beautiful and fitting arrangements alike. Voice acting for the anime is somewhere around average. A special shout-out goes to Suzuko Mimori as Nanami for her womanly voice and determined way of speaking, no matter the situation. This one sits in a precarious position. It’s pretty funny at times; the character interactions are repetitive but usually managed to make me laugh. And Nanami herself is hysterical when she wants to be. At the same time, a lot of the drama didn’t do much for me. The loneliness theme is executed well, but I never felt worried or concerned for Akura-ou, Kurama, or Jiro. In other words, I never felt invested in what the anime had to offer. Beyond this, I found the romantic parts of the show to be sorely lacking. Part of this is due to Tomoe searching to understand his own self, but because of this, the show chooses to forego any sort of worthwhile relationship between him and Nanami, acting more as a regress than as development in the bond they seemingly share. However, there were some pretty interesting scenarios. Nanami accidentally getting into Tomoe’s bed was tense to watch whereas Nanami as a toddler and a child was way too adorable to see. The overall experience was pretty flat, but very specific moments like these didn’t make the show entirely boring to watch to completion. Kamisama Hajimemashita 2nd Season performs at about the same level as its prequel. The narrative takes on loneliness to the best of its ability and the characters are developed in a peculiar way. But the alright animation and sound-work keep it from being something too good. There’s apparently still more to be said about the god and “yokai” pair, so hopefully any further continuations can capitalize on the foundations already crafted. If not, they really will become lonely.